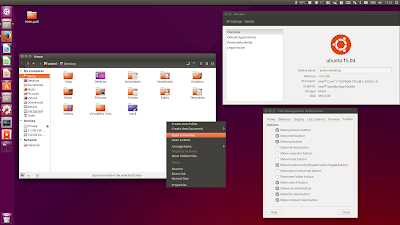 Quick update: Nemo with Unity patches is available for Ubuntu 15.04 Vivid Vervet. For those not familiar with Nemo, this is the default Cinnamon file manager and is a Nautilus fork. Nemo continues to provide many of the features removed from Nautilus, like the extra pane or the toggle location button, but there are some other changes as well, like a customizable toolbar (you can add or remove the up/refresh/search/etc icons), a warning is displayed when running Nemo as root, built-in "Open as root", "Open in terminal" and "Set as wallpaper" context menu items and much more. While Nemo from the official Ubuntu repositories is built for the Cinnamon desktop, Nemo from the WebUpd8 Nemo PPA is patched to work under Unity (but it should work with other desktop environments too): there are patches to get Nemo to handle the desktop, to support Unity quicklists and the Unity Control Center, removed Cinnamon dependencies, along with other tweaks and fixes imported from Ubuntu's Nautilus. Since there's no point in reposting the instructions, see THIS article for how to install and optionally set Nemo with Unity patches as the default file manager in Ubuntu 15.04, 14.10 or 14.04 (there's also an older Nemo version for Ubuntu 12.04).